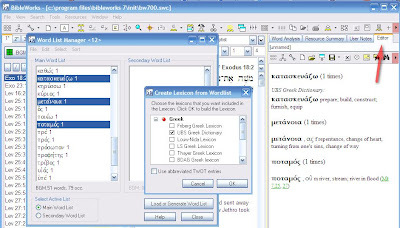 This is the fourth in a series on the Word List Manager in BibleWorks7. Here are 1 and 2 and 3. Here are some other ways you can use the Word List Manager to make comparisons between various texts and even various databases. Simply remember to use the morphological databases to generate your lemma lists. Authorship issues in the NT often involve arguments about vocabulary. If someone were really ambitious, they could do the whole JEDP thing for the Torah! Another nice feature of the WLM is the ability to create lexicons from selected entries. Use these steps to create a quick lexicon to memorize unfamiliar words. Generate a word list from any text range you choose. You will need to use a morphological version (BGM, BNM, BLM, WTM), and you do need to check the box to "Keep Greek accents and Hebrew vowel points." Click on the words you want to use. In the the WLM window, click on File > "Make Lexicon from selected words (send to editor)"
In the Analysis Window (the pane on the right in BW7), click on the Editor tab to see your results. You can edit/print the notes in the window or copy/paste them into another word processor. If you have other suggestions, please share them in the comments. I'm looking at how to accomplish similar tasks in Logos, but it does not appear to be nearly as easy or fast.